With the start of school Friday, August 17th for West Central High School students, preparations for the arrival of the student body have been going on at a fever pitch. 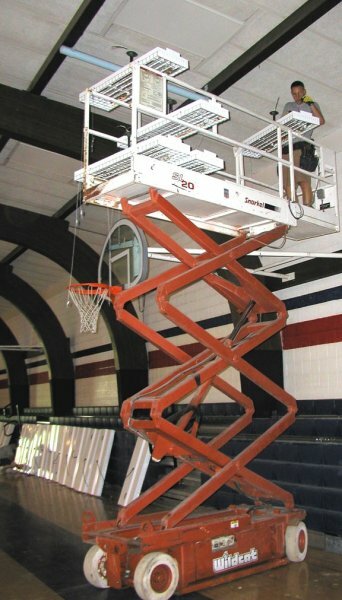 Recently workers from BLI Lighting Specialists completed the total replacement of outdated light fixtures in the WCHS gymnasium, replacing the old units with much brighter, more energy efficient fluorescent fixtures. Additional work being done at the high school includes a new heating/ventilation system in most of the classrooms. School cleaning and update work projects were on schedule to be complete by the time teachers begin their first day back to school today. 8 a.m. - 10 a.m. Pre-K Orientation is scheduled in Media for Friday, August 17. At all other levels, early dismissal is set for 10:30 a.m. Friday morning. The football scrimmage is set for Friday evening at the high school for the public along with an auction.